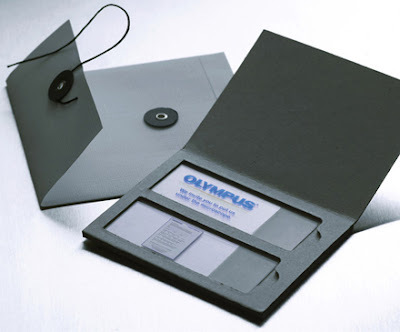 The summary text in Youtube says "When one has great hand skills, making money is easy ... spot the trick if you can ..."
Olympus sends out microscopic questionnaire. Well played, marketing guys, well played. On the most recent edition of his new show, he reported on Tuesday that the new 787 Dreamliner aircraft may be unsafe. Since then, dozens of news agencies have jumped on the bandwagon. Most of them are reporting that the carbon fiber frame may not be as safe as aluminum. Few have bothered to question Rather's claims that the composite materials are brittle, more likely to shatter on impact, and prone to emit poisonous chemicals when ignited. I haven't yet watched the segment, but I have read the full transcript [doc]. As a researcher trained materials engineering, I consider the written summaries that appeared in the news today to be very misleading. While there is a lot of weight behind the argument that composite materials are not as well-studied as aircraft aluminum, the reasoning behind the flurry of recent articles may be faulty. First off, if a plane crashes, the composite frame will definitely not be the only source of toxic fumes. Second, high performance composites have been used in fighter aircraft and for years. Sports cars, race cars, and train cars made from composite materials have endured fantastic crashes. Claims that the impact toughness of carbon fiber is inadequate may be premature. The title of Rather's story, Plastic Planes , indicates a lack of grounding in science. High-performance carbon composites are far stronger than plastics. My main concern is how well they will hold up to water -- a point that is only briefly touched on during the show. Because they are vulnerable to slow and steady degradation by moisture, the new materials may not last as long as aluminum. The report by Rather was correct to explain that testing them for wear and tear will be more difficult. That was, perhaps, his most valid point. I agree, the Wagner is an inspired choice on this bit of stupid driving youtube ha ha. And speaking of: You call that Wagner? I can now tell you that Rule 240, under the appropriate boundary conditions, actually does work. So I am here at home now, instead of six to twelve hours from now. Also, the flight I was on was packed, and as it was filling up, a veteran came down the isle on crutches. He apparently had been injured and disfigured in Iraq. A short while later, a passenger from first class came back and traded seats with him. That indeed was neat. I've been flying a lot, which has given me the opportunity to stare at the back of the passenger seat in front of me for about 40 hours this month. American Airlines divides their MD-80 rows into five seats, with two on one side and three on another. The overhead bins are likewise proportioned, with bags fitting sideways only on the narrow side. On all of these fully loaded flights, the starboard has a lot more passengers and luggage than the port-side. So why don't the planes tip over and barrel roll their way across the sky? Actually, the real miracle is that all of my flights have arrived early. And not just the pulling away from the terminal and sitting on the tarmac early. I would have lost money betting on that. I suspect this won't last. 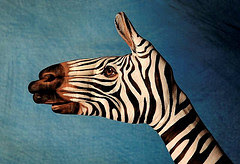 Eric pointed me to this cool flickr set of hands that have been painted like animals. Lessons in going for the gusto: Gamma-Ray Annihilation Lasers. Di-positronium, as the new molecule is known, was predicted to exist in 1946 but has remained elusive to science. Now, a US team has created thousands of the molecules by merging electrons with their antimatter equivalent: positrons. The discovery, reported in the journal Nature, is a key step in the creation of ultrapowerful lasers known as gamma-ray annihilation lasers. "The difference in the power available from a gamma-ray laser compared to a normal laser is the same as the difference between a nuclear explosion and a chemical explosion," said Dr David Cassidy of the University of California, Riverside, and one of the authors of the paper. Di-positronium, as the new molecule is known, was predicted to exist in 1946 but has remained elusive to science. "The difference in the power available from a gamma-ray laser compared to a normal laser is the same as the difference between a nuclear explosion and a chemical explosion," said Dr David Cassidy of the University of California, Riverside, and one of the authors of the paper. That is one hell of a press-release. Which is to say that it is a key step, in the same way as the first Chinese fireworks were key to the Apollo moon landings. On the subject of lasing a stick of dynamite, Chris Knight could not be reached for comment. i.e., Throwing like a girl... I can write with both hands (kinda), but I think I might fall over if I tried to throw left-handed. 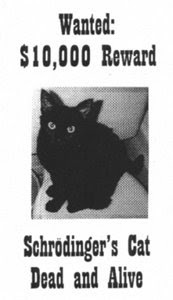 I've never reached this point myself, but sometimes you feel like you have way too much money and you need to find an appropriate outlet to help rid you of your surplus. As the joke went, come to (private liberal arts college), and we'll help you with this problem. But perhaps you're past that point. The canonical solution is a boat, which is a hole in the water that you shovel money into (cars/airplanes/trophy spouses...). Surely fiberglass is enough drain the checking accounts of the mortal below, but you stride the earth like a giant, and maybe you need to up the degree of difficulty? 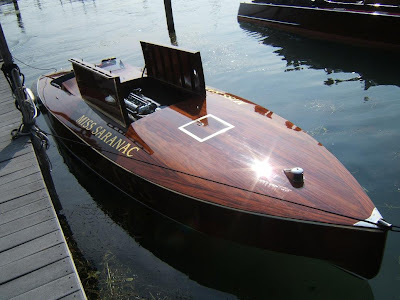 Well, how about a vintage wooden speed boat featuring a blown Jag? 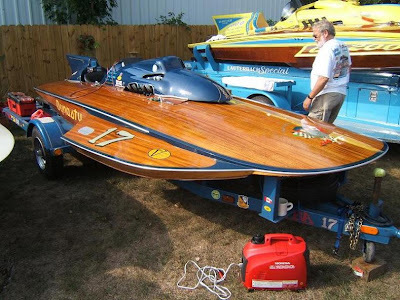 I like the hydroplane with the Buick Nailhead too. Clive Owen has managed to find a stupider (yes, stupider) movie to be in than Sin City. Which, on some level, is impressive. The reviews probably say that this movie is exactly what it says it is, but if that were true, they would call it, "Stab 'Em wit a Carrot, G'vnor." It is, oddly, a shoot-em-up which is virulently and incongruously anti-gun. Do as I preach, not as I do and which, incidentally, solves all of my problems. I'm not sure this occurred to anyone involved in the movie. My friend thought it was a quotable movie. I have to disagree and say that, unless you consider Last Action Hero to be Shakespeare, it's just full of terrible one liners. And plot holes. Make that plot-Swiss cheese. And meta-references which the writer/director probably thinks are a lot more clever than they are. I know it's supposed to be a dumb action movie, but this one rubs it in. Also, Monica Bellucci has hit the tipping point. That point happens to be between a 10 and a 9.9, but still. 1. Declare war on those involved. If you like action flicks with a bit of the ultraviolence, it's a 5, otherwise, it's a 4. (Except that it would never appear on TV due to content). NB, there's a lot of furor over Apple's $200 iPhone price drop. The outcry from the early adapters isn't over the money, but just the fact that the hoi polloi have been let into their gadget club. NB the second, it's still the same contract (probably), whose total cost is ~$2k+ over two years. So go ahead and save $2oo if you like, you shrewd wait-three-months shoppers. NB 3: I might get one of those new iMacs, though. My trusty laptop is 5 years old, and the vacuum tubes are getting harder to find. Corrupt Official Plagiarizes Trial Apology. "The only winner in the War of 1812 was Tchaikovsky"
He truly was a wise man, but the wisest? Also, perhaps I've friendly-fired* myself with that last quote of his (*alt, "self-inflicted rim-shot wound"). Via the internet and the vacuum ground state. After having, 20 years ago, missed the opportunity to see this 1986 movie by Roland Joffe', I caught it recently. The movie is quite rich and I liked it much; and of all the themes that the movie deals with I shall just talk about one. One of the keystones of the philosophy of capitalism (capitalism has an underlying philosophy besides being a awy of organizing things IMHO) is that "productive" creativity belongs just to those who are trying to achieve their personal interest. Maybe the creativity of the artist and the scientist could be exercised in a disinterested way (that would be the "ars gratia artis"), but according to the philosophy of capitalism that can't be done for the productive and organizational side of things, for that creativity that always finds new energy to manipulate things in order to make easier and smoother the way they work. Similar ideas are articulated for example in a book by Eric Hoffer, "The true believer", that some not unknown person lent me - and as far as I known is a popular and widely read book; and naturally, the Economist praises these ideas, a bit every week. It seems to me that the example of the "reducciones", communities organized by the Jesuits with and for the indios in Paraguay in 1600, which is the main topic of this movie, points to the exact opposite direction; I saw in it a creative and organizative energy of the same kind of the one that th eowner of a small company may put in his own activity - but without the spur of caring for one's own personal interest. At least for me, this is quite a significant example. Unlike Ambrose Bierce's work, this Dictionary of Management Jargon isn't satirical. I think. Or is that Uncle Monkey? Actually, I kinda like that one - it has an appropriate Rainman feel to it. But enough about me, just some good news, these last two weeks have seen Collin and Beatrix added into the fold, and I'm super happy that they arrived safe and sound. Both of my sisters are already back in the rice fields, which is good, because they have a lot of work to make up!